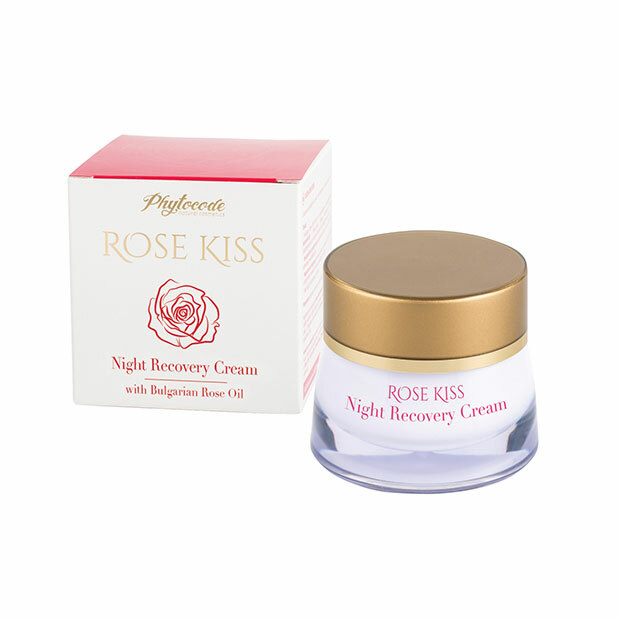 Recovery Night Cream is designed with effective natural anti-aging and anti-wrinkle ingredients. The cream stimulates your skin while you sleep. The regular use of Recovery Night Cream revitalizes the texture of the skin, helps to enhance radiance, firmness and tone for a more youthful appearance by morning. Green Micro-algae extract -stimulates collagen synthesis in the skin, increases skin firmness and has the ability to restructure and smooth out the surface of the skin. Bulgarian Rose Oil – helps to retain skin’s moisture and to refine skin texture. Moringa Oil – rejuvenates dull and tired skin, helps improve the appearance of wrinkles and fights free radical damage. Maritime pine bark extract – increases the skin’s hyaluronic acid production and enhances skin elasticity. Result: The visible signs of aging are reduced and the skin is repaired while you rest. For best result use also Rose Kiss Protective Day Cream. Directions for use: Apply each evening with light massage motions on well cleansed face. Gets absorbed quickly.